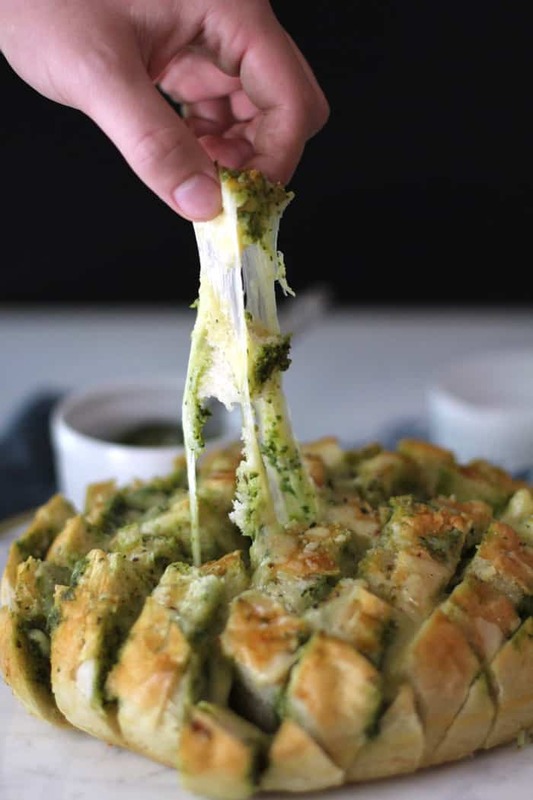 Cheesy Pesto Party Bread is a huge crowd pleaser. 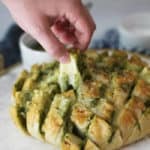 This simple party appetizer is just a loaf of French or sourdough bread, filled with pesto sauce, two types of cheese, a big drizzle of olive oil, and freshly ground black pepper. I’ve made this party bread a few times here at home, and it’s beginning to be a problem. The problem being that it feeds a crowd, at least it should. Bread is our weakness around here, so testing it out is both good and bad. I really need to invite peeps over next time I make it! You can easily keep everything on hand (see the end of this post for deets!) for this recipe. This is an “all hands in” type of party food. You just dig in with your fingers and have a napkin (or two) handy. 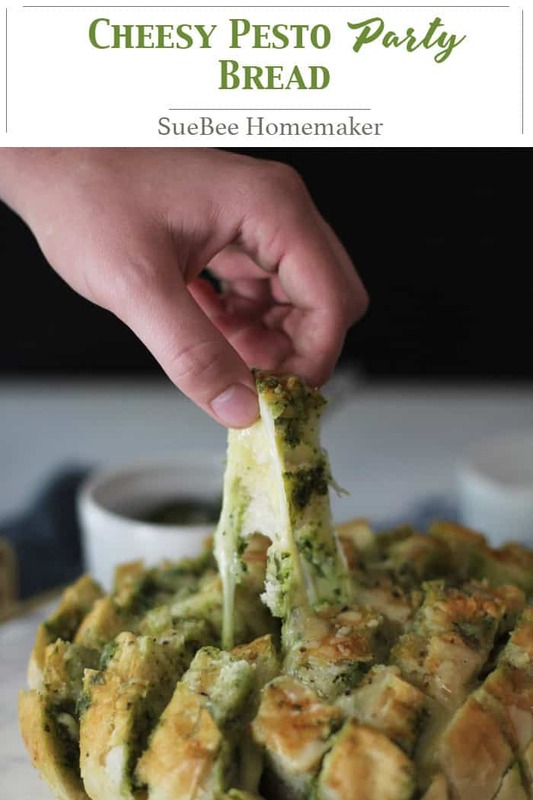 It’s ooey, gooey, cheesy, pesto deliciousness! Thank me later! You’ll never have any leftovers when making it for a crowd. Everyone loves it! Duh, right? 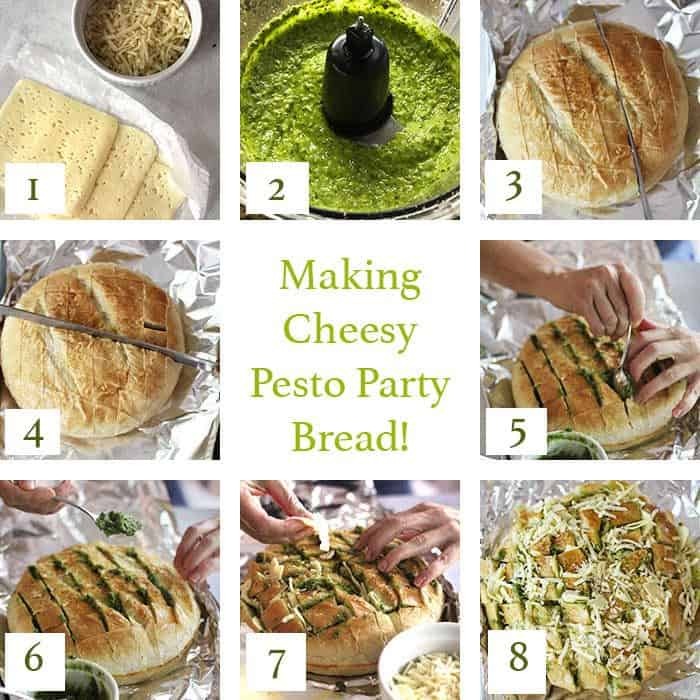 How to make Cheesy Pesto Party Bread. Set your cheeses out on the counter. Make homemade pesto sauce using my recipe, or store bought is fine too. Take a loaf of French (my mom’s recipe is what I used) or sourdough bread, and slice it in one-inch chunks, slicing in both directions – but DON’T SLICE ALL THE WAY THROUGH. You want the loaf to stay in tact while baking. Place the loaf on a prepared baking sheet. Spoon some pesto sauce in all the crevices, trying to get some way down in the cracks of the bread. 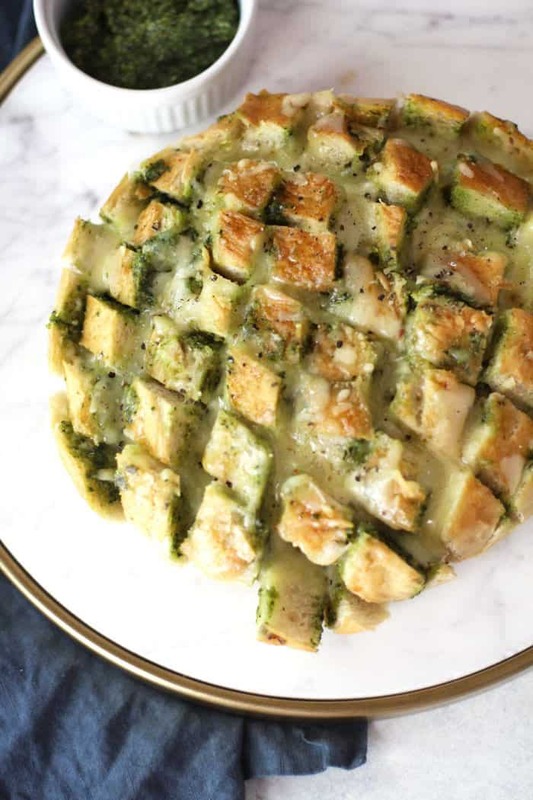 Aim to get pesto sauce surrounding every square. Using your fingers, put as much cheese in the crevices as well, trying to get some in every inch of the bread. As it gets full, you’ll need to be careful to not break the loaf apart. Drizzle some olive oil over the top, and then a bunch of freshly ground black pepper. Carefully place a piece of tinfoil loosely over the bread. Don’t let the foil touch the cheese, if you can. Bake for 20 minutes on 400 degrees, and then bake uncovered for a few minutes to slightly brown the cheese. Tips to having all the ingredients on hand for this recipe. Keep some French bread in your freezer at all times. I take my mom’s recipe, and instead of using French bread loaf pans, I make a couple loafs in my cast iron skillets. Make up a double batch of pesto sauce, and freeze small portions for when you need it. BTW, when you freeze pesto sauce, the colors don’t stay as vibrant, but the taste is still wonderful. Keep a few kinds of cheese handy in your refrigerator. I used havarti and pepper jack, but any variety that you prefer would be just as good. Crack open a beer, or a bottle of wine, and happy hour is NOW. Just don’t forget the party bread. This simple bread will be the hit of your party! Fill it with different kinds of cheese and a pesto sauce, and then drizzle some olive oil over the top. So delicious! ** See blog post for step-by-step pictures and instructions! Preheat oven to 400 degrees. Prepare a baking sheet with tinfoil. Slice the bread into a checkerboard pattern, carefully to avoid cutting all the way through. Leave 1/4 of an inch on the bottom. Spoon pesto sauce in all the crevices, evenly distributing it. Using your fingers, place both kinds of cheese in the crevices as well. Drizzle loaf with olive oil, and top with freshly ground black pepper. Loosely cover the loaf with a sheet of tin foil. Try to keep the foil off of the cheese. Bake for 20 minutes covered, and then remove foil and bake another few minutes to slightly brown the top. When cutting the bread in chunks, be careful to NOT cut all the way through the bread. You want it to stay in tact. Using homemade pesto sauce is best, but store bought is ok too. You can use a variety of different cheeses, according to whatever you like best. Using a foil tent during part of the baking time will ensure the cheese doesn't burn. Just watch it carefully. What an awesome idea/recipe. Plus, the name is perfect for me. I love Cheesy. I love Pesto. I love Party. I love Bread! 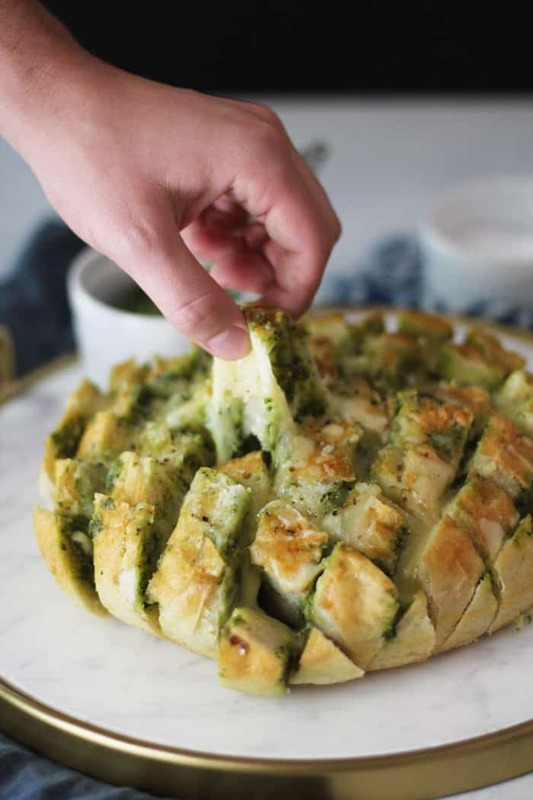 So, I must love Cheesy Pesto Party Bread!